Alternatively translated as "The ba of Sahure appears"
The Pyramid of Sahure (in ancient Egyptian Kha-ba Sahura meaning The rising of the ba spirit of Sahure) was built in the 24th century BC for the Egyptian pharaoh Sahure, the second king of the Fifth Dynasty. [a] It the first pyramid built in the necropolis of Abusir, Egypt. Sahure's pyramid is part of a larger mortuary complex comprising a temple on the shores of Abusir lake, a causeway from this temple to the mortuary temple located against the main pyramid and a separate cult pyramid for the Ka of the king. The pyramid complex of Sahure was extensively excavated at the beginning of the 20th century by Ludwig Borchardt and is now recognized as a milestone in ancient Egyptian tomb architecture, its layout defining a standard that would remain unchanged until the end of the 6th dynasty some 300 years later. The valley and mortuary temples as well as the causeway of the complex were richly decorated with over 10,000 sq. m (107,640 sq. ft) of fine reliefs that made the complex renowned in antiquity. The mortuary temple is also remarkable for the variety of building materials used for its construction, from the alabaster and basalt floors to the fine limestone and red granite of the walls. Borchardt's 1910 reconstruction of Sahure's temple adorned with numerous fine reliefs. The first investigations of the pyramid of Sahure were undertaken in the mid 19th century by John Shae Perring and Karl Richard Lepsius who included the pyramid in his list under the number XXVIII. These investigations remained superficial, however, and no serious excavations of the pyramid took place at the time, due mainly to its state of ruin. The pyramid was entered for the first time a few years later by Jacques de Morgan but he too did not explore it further. Realizing the significance of the pyramid, the egyptologist Ludwig Borchardt undertook extensive excavations of the site between 1902 and 1908, exploring the entire mortuary complex. He published his discoveries in a two-volume study Das Grabdenkmal des Königs Sahure, "The Funerary Monument of King Sahure", which is still considered the standard work on Sahure's complex. Side entrance of the pyramid complex, 1910 painting from L. Borchardt's excavation report. During the excavations, Borchardt discovered the still largely intact architrave of the mortuary temple as well as a group of palmiform columns. He sent some of these columns for exhibition in Germany as was customary at the time, while the rest stayed in Egypt. The columns sent to Germany were to be displayed in the Egyptian Museum of Berlin. However, because of lack of space the columns and other findings from Borchardt's excavations were not displayed before the 1980s, when they were showcased for the first time in the old stables of the Charlottenburg Palace. More recently these were moved to the Pergamon Museum. Borchardt's work was very thorough and a further survey undertaken by Vito Maragioglio and Celeste Rinaldi in the early 1960s yielded no fundamentally new results. Sahure preferred the site of Abusir for the construction of his mortuary complex to the heavily built necropolis of Saqqara. In doing so he might have been influenced by the presence of Userkaf's sun temple, located about 400 m (1,300 ft) to the southeast of the rocky promontory on which Sahure's pyramid stands. The proximity of the Abusir lake which made the complex easily accessible for the funerary cult of the king. The proximity of Memphis the capital and seat of power at the time. In particular, Sahure's palace Wetjes neferu Sahure, "Sahure's splendor soars up to heaven", might have been located in the vicinity of Abusir. Regardless of Sahure's motivations, the construction of his complex marks the birth of the necropolis of Abusir which would serve at least until the Saite period some 2000 years later. The pyramid of Sahure is smaller than Userkaf's and stood less than one third the height of the great pyramid at the time of its completion. In the meantime a comparatively greater emphasis was put on the construction of the mortuary temple and its decoration. The pyramid complex was completed during Sahure's lifetime as witnessed by reliefs of the causeway discovered in 1994 and showing the ritual celebrations accompanying the completion of the pyramid. Sahure's complex represents a milestone in the development of pyramid construction techniques. Except for minor deviations, the pyramids of the Fifth and Sixth Dynasties followed the model of Sahure's pyramid. The size of the monuments diminished, the mortuary temple was redesigned, and the layout of the substructure was standardized. In tandem, relief decoration proliferated and the temples were enriched with greater storeroom complexes. Sahure's mortuary temple contained ~370 running metres, with the whole complex including valley temple and causeway comprising up to 10,000 m2 (110,000 sq ft), of relief decorations. By contrast, Sneferu's pyramid complex contained 64 running metres of relief decoration, Khufu's contained 100 running metres, and Userkaf's, predecessor to Sahure, contained 120 running metres. Sahure's 4,246 m2 (45,700 sq ft) large temple complex contains 916 m2 (9,860 sq ft) (21.6% of total area) dedicated to storerooms. This was a stark departure from the standard of the Fourth Dynasty. The temple of Sneferu's Red Pyramid, covering 800 m2 (8,600 sq ft), at Dahshur and of Khufu's Great Pyramid, covering 2,000 m2 (22,000 sq ft), contain no storerooms. Storerooms appear in Khafra's pyramid temple, covering 1,265 m2 (13,620 sq ft), and occupies less than 200 m2 (2,200 sq ft) (15.8% of total area). Sahure's mortuary complex is oriented on an east–west axis and comprises all the standard elements of a mortuary complex: a valley temple located on the shores of the Abusir lake linked to the main enclosure via a long causeway and, within the enclosure wall, the main pyramid, the mortuary temple and a smaller cult pyramid. Remarkable is the absence of peripheral burials for the members of the royal family. Indeed, no mastaba or pyramid of a queen dating to Sahure's time has been discovered as of 2012 in the immediate vicinity of Sahure's pyramid. This is in rupture with a tradition dating back at least to pharaoh Sneferu and that would be followed by Sahure's successors. Consequently, Sahure's consort queen Meretnebty, is only attested through carved reliefs found in the mortuary temple. The reason for this absence is unknown. The complex also lacks a northern chapel located close to the main pyramid entrance. However, this type of structure was unknown at the time of Borchardt's excavations and any existing sparse remnants may thus have remained undetected. The pyramid appears to have been built on a platform constructed from at least two layers of limestone blocks, rather than embedded directly into the bedrock. The core of the pyramid was built up in six horizontal layers consisting of low-grade roughly cut limestone blocks, and bound together with mud mortar. This was then encased by large carefully cut blocks of fine white limestone, that had come from quarries near modern-day Maasara. A ditch was left in the north face of the pyramid during construction which allowed workers to build the inner corridor and chambers while the core was being erected. The gap was later filled in with rubble. This technique of construction, albeit simpler and less consuming of time and material, is responsible for the ruined state of the pyramid. Owing to the poor condition of the monument, information regarding its dimensions and appearance contain a degree of imprecision. The pyramid had a base length of 78.75 m (258.4 ft; 150.3 cu) converging towards the apex at an angle of approximately 50°, giving it a height of 47 m (154.2 ft; 89.7 cu) on completion. The pyramid's architects made a notable error in demarcating the base, causing the southeast corner of the pyramid to extend 1.58 m (5.2 ft) too far east. Consequently, the base is not square. Unfinished Pyramid of Neferefre, showing the T-shaped ditch construction technique. Model of Sahure's pyramid complex, Metropolitan Museum of Art. The ruined pyramid as seen from the open courtyard of the mortuary temple. North–south cross section of the pyramid of Sahure. Beige: fine Tura limestone casing; red: red/pink granite portcullis and reinforcements; light gray: pyramid core of low-grade limestone; medium gray: limestone foundation; dark gray: bedrock. The entrance into the pyramid substructure is located slightly above ground level and east of centre on the pyramid's north face. The entrance gives access to a 4.25 m (13.9 ft) long descending corridor with a slope 24° 48′, with a width of 1.27 m (4.2 ft) and height of 1.87 m (6.1 ft). This terminates at a small vestibule guarded by a single red granite portcullis at its end. The corridor continues behind the portcullis, though now slightly inclined and is lined with limestone. This section is 22.3 m (73 ft) long with a slope of 5°. It ends with a short 3.1 m (10 ft) long horizontal section lined with granite. Across its length, the corridor is reinforced with red granite in three places: the entrance slope, for a few feet on either side of the portcullis, and a section of the corridor end. The chambers of the substructure have been severely damaged through stone-robbing preventing reconstruction of the original plan. Sources differ on whether the substructure comprises an antechamber and burial chamber, or a single burial chamber. The chamber was constructed from Tura limestone. The dimensions of the underground room are proposed to be 12.6 m (41 ft; 24.0 cu) by 3.15 m (10.3 ft; 6.0 cu). The roof of the chamber(s) were gabled consisting of three superimposed layers of Tura limestone blocks. The largest blocks were estimated by Egyptologist John Shae Perring to be 10.6 m (35 ft) long, 3 m (10 ft) wide, and 4 m (13 ft) thick. Despite the size and weight of the blocks, only two remain unbroken. The last measurements of the underground chambers of the Abusir pyramids were taken in the 1960s by researchers Vito Maragioglio and Celeste Rinaldi. They refrained from speaking, instead communicating through writing, for fear of provoking the collapse of the ceiling. In the ruins of the chamber, fragments of a basalt sarcophagus found by Perring are the only remnants of the burial. Sahure's valley temple was located on the shores of Abusir lake. It was rectangular in plan, being 32 m (105 ft) long and 24 m (79 ft) wide, and oriented on a north–south axis. The base of walls of the temple were carved with concave molding and the corners of the temple were rounded. The valley temple is now in ruins and partly obscured as it has been buried over time by up to 5 m (16 ft) of sludge deposits from the lake. It is nonetheless considered the best preserved valley temple of Egypt after that of Khafre. The main entrance to the valley temple was, as usual, located on the eastern side. It comprised a ramp directly in front of a portico with two rows of four palmiform columns made of red granite. Less common was the presence of a second entrance on the southern side of the temple, apparently built after the main entrance during a second phase of construction. The southern entrance was accessible via a canal and comprised a ramp and a portico with four columns. These were simple conical pillars without capital. Borchardt proposed that this entrance was reserved to the priests. Finally, a wall there suggests the presence of the pyramid town The Soul of Sahure Comes Forth in Glory in the close vicinity of the valley temple. In the center of the temple was a small T-shaped hall with two columns. The hall comprised a staircase access to a roof terrace and led westward to the causeway. The floor of the hall was paved with black basalt, its ceiling was decorated with star patterns, and the limestone walls were adorned by a pink granite dado and, above, by painted reliefs depicting the king hunting. Plan of Sahure's valley temple. Borchardt's reconstruction of Sahure's valley temple (1910). Model of the valley temple, collection of the Metropolitan Museum of Art. A 235-metre-long (771 ft) causeway connected the valley temple of Sahure's pyramid complex to the mortuary temple. The causeway was roofed, its side walls, ceiling and flooring being made of limestone slabs, some of which are still visible today. In between the ceiling slabs were narrow slits allowing natural light to penetrate the ensemble. The walls of the causeway were covered with painted reliefs throughout, some of which were discovered during the excavations started in the mid-1990s of the upper part of the causeway. These include representations of the king as a Sphinx trampling over his enemies, a procession of enemies being led by gods, depictions of the bringing of the pyramidion to the main pyramid and of the ceremonies following the completion of the complex. Among the reliefs recently discovered, one showed the king with his royal entourage in the garden of his palace Wetjes neferu Sahure. There, next to a personage named Ranefer, the text Neferirkare, King of Upper and Lower Egypt had been added. Thanks to this inscription, egyptologists such as Miroslav Verner and Tarek el-Awady now believe that Neferirkare Kakai was the eldest son of Sahure and bore the name Ranefer before his accession to the throne. Alternatively, Neferirkare Kakai could be a brother of Sahure, in which case he may have usurped the throne at the expense of his nephew, Netjerirenre. 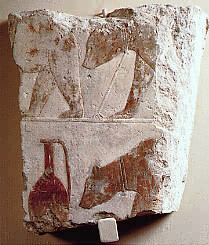 Another important limestone block shows Sahure cultivating a Myrrh tree in what is probably the garden of his palace. The same block also shows four ships coming back from an expedition to Punt, loaded with Myrrh trees, people from Punt as well as dogs and donkeys. Finally, a relief showing starving Bedouins was unearthed, which is very similar to the one from the pyramid of Unas. This discovery is significant as Unas' relief was thought to be the unique witness of a real event: the declining quality of life of Saharan Bedouins brought about by the end of the Sahara wet phase c. 2350 BC, when it has in fact a mostly symbolic value. 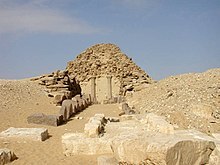 Sahure's mortuary temple represents the definitive prototype for all later pyramid temples of the second half of the Old Kingdom. For the first time, the funerary and sacrificial temple are no longer separated but rather integrated together in a continuous east–west arrangement within the complex. The ensemble was built of and clad with fine Tura limestone and extensively decorated and worked throughout. Here again, the base of walls were carved with concave molding and the corners of the temple were rounded. Map of Sahure's pyramid complex. 1) Entrance hall, 2) Closed corridor, 3) Pillared courtyard, 4) Magazine rooms, 5) Offering chapel, 6) Main pyramid, 7) Cult pyramid, 8) Side entrance, 9) Five niches chapel, 10) Transverse corridor. The temple was accessed from the eastern side by a causeway that led to a 21-metre-long (69 ft) entrance hall. This hall had a nearly 7-metre-high (23 ft) stone barrel vault, a limestone flooring and a pink granite dado. The walls were covered with extensive painted reliefs. In ancient times, the entrance hall was known as pr-wrw, "House of the Great Ones". Borchardt believed this hall served as the final station for the funeral procession of the king before the burial proper. From the hall, a large granite door led to an open courtyard, which was lined with 16 monolithic pink granite columns supporting a monumental granite architrave. These columns were carved so as to resemble the trunk and crown of a palm tree, which was regarded as a fertility and eternity symbol. According to Herbert Ricke, these columns represent the sacred palm grove of Buto. Here again, Sahure's temple served as an example for his successors: plantiform columns became the standard for columns of pyramid temples throughout the second half of the Old Kingdom. 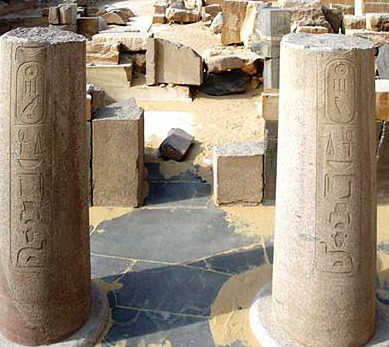 The columns all bore the names and title of Sahure as well as representations of the snake goddess Wadjet symbolizing Lower Egypt in the northern part of the courtyard and the vulture of Nekhbet, goddess of Upper Egypt, in the southern half. The granite architrave was inscribed with the complete royal titulary of Sahure and supported limestone ceiling slabs decorated with stars on a blue background. The walls of the courtyard, made of Tura limestone, were adorned with fine reliefs showing Sahure's victories against Asiatics and Libyans, as well as prisoners and other spoils from the battles. The courtyard was paved with irregularly shaped but polished black basalt slabs, some of which are still visible today. In the northwest corner was an alabaster altar decorated with the symbols of Egyptian unification and scenes of offerings made to Sahure. Finally, the courtyard may have housed life-size statues of the king between the columns. The courtyard was surrounded by a corridor whose walls were covered with painted reliefs. These represented Sahure hunting, fowling and fishing in presence of his courtiers, thereby demonstrating the king's control over nature, one of his sacral duties. Finally, a relief found in the ruins of the courtyard depicts Syrian brown bears. Remnants of the massive granite architrave inscribed with Sahure's titles. Palmiform column from the open courtyard. The ruins of the courtyard. A relief depicting defeated enemies from the walls of the courtyard. The western end of the courtyard leads to a transverse corridor that separated the public from the sacred part of the temple only accessible to the priests. The decoration of this corridor was similar to that of the courtyard with a black basalt flooring, granite dado and decorated limestone walls. The few surviving fragments of the reliefs from the east wall show ships coming back from a naval expedition to Syria. The transverse corridor served as an access to various parts of the inner temple. In its center part was an alabaster staircase on both sides of which were two papyriform columns set into deep niches. The columns supported a granite architrave which fell victim to stone robbers and can now be found in the oil press of St. Jeremiah monastery in Saqqara. Both of these deep niches were decorated with reliefs depicting offering bearers and led to two-story galleries of magazine rooms. The gallery accessible from the northern niche consisted of 10 rooms which housed the cultic objects used for the rituals carried out in the mortuary temple. The southern gallery comprised 17 rooms, which probably served as storage rooms for the offerings. Each magazine room contained a staircase to the second floor, some stairways being carved directly into the masonry of the wall. At the northern end of the transverse corridor were a few more chambers and a passageway to the court surrounding the main pyramid. In addition, there was a stairway to the roof terrace of the temple. The southern end of the transverse corridor similarly led to a few chambers, which in turn led to the main pyramid as well as to the small courtyard of the cult pyramid. There lay a small portico in the enclosure wall with two inscribed granite columns. This portico served as a service entrance to the pyramid complex for the deliveries of goods to the magazine rooms. At the center of the transverse corridor, the staircase led to a chapel with five niches. This chapel had an alabaster floor, a dado of pink granite and splendidly decorated limestone walls, with the exception of the niches in the west wall and the dado. The ceiling was adorned with stars. The niches housed cult statues of the king, none of which has survived to this day. Relief from the transverse corridor depicting the return of a naval expedition from Syria. Return of a naval expedition from Syria. Granite column of the side entrance. A ceiling slab decorated with stars. At the southern end of the five niches chapel, a passage led to two elongated antechambers and finally to the offering chapel. There took place the sacrificial offerings for the king after his death. The offering chapel was directly adjoining the main pyramid eastern side as was customary. The focus of the chapel was a false door, a roughly worked granite slab that would have given Sahure's spirit access to the food offerings made for him according to ancient Egyptian beliefs. Unusually, this false door was uninscribed when it should have borne the name and titles of Sahure as well as magical spells. This observation led Borchardt to propose that the granite slab was once covered by a copper or golden panel bearing the necessary inscriptions, of which no trace remains today. The offering chapel had an alabaster flooring and a vaulted limestone ceiling with star decorations. It housed a black granite statue of the king. There was also a basin for collecting liquids which had an outflow of copper tubing. This was connected to a vast drainage system made of copper pipes laid under the pavement of the temple and leading to a central, limestone-lined, wastewater channel. Overall, the drainage system comprised approximately 380 m (1,250 ft) of copper piping. The basin was sealed with lead plugs. Immediately to the north of the offering chapel, a granite doorway led to five more chambers, which probably served to prepare the food offerings. In two of these were further basins connected to the drainage system via copper pipes. The southeastern part of Sahure's pyramid complex was occupied by a small cult pyramid, with its own enclosure wall and courtyard. Cult pyramids were erected during the Old Kingdom as tombs for the Ka of the deceased ruler. The pyramid originally stood 11.55 m (37.9 ft) high with a base of 15.7 m (52 ft) and a slope of 56°. Its inner core comprised two steps of roughly hewn limestone blocks clad with fine Tura limestone. This construction technique, with a low-quality core masonry, meant a considerable saving of labor at the time of the construction. However, as the outer casing of pyramid fell victim to stone robbers throughout the millennia, the loosely assembled core material was progressively exposed and fared much worse over time than that of the 4th dynasty pyramids. Thus, today the cult pyramid is ruined beyond recognition. The pyramid courtyard was accessed either from the transverse corridor or through the side entrance of the mortuary temple via a portico with two round columns bearing Sahure's name and titles. No building seems to have stood in this courtyard. At the base of northern side of the pyramid was a passage leading to a T-shaped underground chamber, oriented on an east–west axis and under the tip of the pyramid. No artifacts were found onsite during the excavation of this chamber which might have housed a statue of Sahure's Ka. The courtyard of Sahure's mortuary temple became the center of a cult of the goddess Sekhmet from the 18th dynasty onwards. This choice of location may be linked with the extensive fine reliefs of the goddess carved on the walls of the courtyard. At the beginning of the Christian era, the temple became a Coptic church. 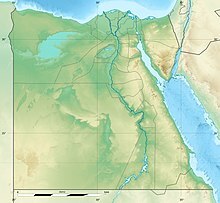 ^ Proposed dates for Sahure's reign: c. 2506–2492 BC, c. 2491–2477 BC, c. 2487–2475 BC, c. 2458–2446 BC, c. 2373–2363 BC. ^ a b Verner 2001d, p. 280. ^ Brugsch 2015, p. 88. ^ a b c d e Lehner 2008, p. 143. ^ a b Hellum 2007, p. 100. ^ Arnold 2003, p. 207. ^ a b Altenmüller 2001, p. 598. ^ Bárta 2005, p. 180. ^ Altenmüller 2001, pp. 597–598. ^ Verner 2001b, p. 588. ^ Malek 2003, p. 100. ^ Zahi Hawass, Miroslav Verner: Newly Discovered Blocks from the Causeway of Sahure (Archaeological Report). In: Mitteilungen des Deutschen Archäologischen Instituts, Abteilung Kairo. (MDIAK) vol. 51, von Zabern, Wiesbaden 1995, S. 177–186. ^ a b Verner 2001d, p. 46. ^ Verner 2002, p. 42. ^ a b Verner 2001c, p. 90. ^ a b c Bárta 2005, p. 185. ^ Verner 2002, p. 43. ^ Verner 2001d, p. 283. ^ a b c d e Verner 2001d, p. 284. ^ a b c d e f g h Lehner 2008, p. 142. ^ Verner 1994, pp. 73 & 139–140. ^ Verner 2001d, pp. 283–284. ^ Stadelmann 1985, p. 165. ^ a b Verner 2001d, pp. 284–285. ^ a b Stadelmann 1985, p. 166. ^ a b c d Verner 2001d, p. 285. ^ a b c d e f Edwards 1975, p. 185. ^ a b Verner 2002, p. 49. ^ a b Tarek el-Awady: King Sahure with the Precious Trees from Punt in a Unique Scene, in: Proceeding of “Art and Architecture of the Old Kingdom”, Prague 2007. ^ Tarek el-Awady: The Royal Navigation Fleet of Sahure, in: Study in Honor of Tohfa Handousa, ASAE (2007). ^ "Egypt: The Monastery of Jeremiah at Saqqara". www.touregypt.net (in Russian). Retrieved 2018-02-26. ^ Peter Jánosi: Die Pyramiden: Mythos und Archäologie p. 80–83, C. H. Beck, ISBN 3-406-50831-6. ^ Miroslav Verner: Die Pyramide des Sahure, in: Die Pyramiden, pp.313−324. Altenmüller, Hartwig (2001). "Old Kingdom: Fifth Dynasty". In Redford, Donald B. The Oxford Encyclopedia of Ancient Egypt, Volume 2. Oxford: Oxford University Press. pp. 597–601. ISBN 978-0-19-510234-5. Arnold, Dieter (2003). The Encyclopaedia of Ancient Egyptian Architecture. London: I. B. Tauris & Co Ltd. ISBN 978-1-86064-465-8. Brugsch, Heinrich Karl (2015) . Smith, Philip, ed. A History of Egypt under the Pharaohs, Derived Entirely from the Monuments : To which is added a memoir on the exodus of the Israelites and the Egyptian Monuments. 1. Translated by Seymour, Henry Danby. Cambridge: Cambridge University Press. ISBN 978-1-108-08472-7. Edwards, Iorwerth (1975). The pyramids of Egypt. Baltimore: Harmondsworth. ISBN 978-0-14-020168-0. Lehner, Mark (1999). "pyramids (Old Kingdom), construction of". Encyclopedia of the archaeology of ancient Egypt. London; New York: Routledge. pp. 778–786. ISBN 978-0-203-98283-9. Malek, Jaromir (2003). "The Old Kingdom (c. 2686–2160 BC)". In Shaw, Ian. The Oxford History of Ancient Egypt. Oxford University Press. pp. 83–107. ISBN 978-0-19-815034-3. Stadelmann, Rainer (1985). Die Ägyptischen Pyramiden: vom Ziegelbau zum Weltwunder. Kulturgeschichte der antiken Welt, 30 (in German). Mainz: von Zabern. ISBN 978-3-8053-0855-7. Verner, Miroslav (2001b). "Old Kingdom". In Redford, Donald B. The Oxford Encyclopedia of Ancient Egypt, Volume 2. Oxford: Oxford University Press. pp. 585–591. ISBN 978-0-19-510234-5. Verner, Miroslav (2001c). "Pyramid". In Redford, Donald B. The Oxford Encyclopedia of Ancient Egypt, Volume 3. Oxford: Oxford University Press. pp. 87–95. ISBN 978-0-19-510234-5. Verner, Miroslav (2002). Abusir: Realm of Osiris. Cairo; New York: American Univ in Cairo Press. ISBN 978-977-424-723-1. Miroslav Verner: Forgotten pharaohs, lost pyramids: Abusir, Netherlands Institute for the Near East, ISBN 978-80-200-0022-4, 1994. Richard H. Wilkinson: The Complete Temples of Ancient Egypt, Thames & Hudson, ISBN 0-500-05100-3, 2000. Zahi Hawass, Miroslav Verner: Newly Discovered Blocks from the Causeway of Sahure (Archaeological Report). In: Mitteilungen des Deutschen Archäologischen Instituts, Abteilung Kairo. (MDIAK) vol. 51, von Zabern, Wiesbaden 1995, S. 177–186. Wikimedia Commons has media related to Pyramid of Sahure. This page was last edited on 7 March 2019, at 05:12 (UTC).